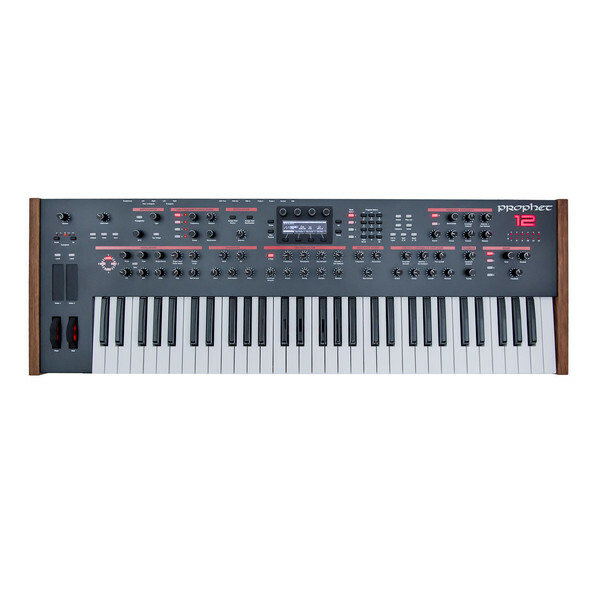 The Dave Smith Instruments Prophet 12 synthesizer has twelve voices, giving it the greatest polyphony of any DSI synth. Each voice features four oscillators, a sub-oscillator, resonant analogue low- and high-pass filters, and analogue VCAs. The new Character section offers a range of wave shaping and sound sculpting options, including Drive, Hack, Decimation, Girth and Air. The Prophet 12 also features a tuned feedback path, a four-tap stereo delay per voice, expanded arpeggiator functionality, deep modulation capabilities and bi-timbral operation. The LFOs, delay and arpeggiator can all be synced to MIDI, and there are two programmable position- and pressure-sensitive touch sliders as well as the standard pitch and mod wheels. 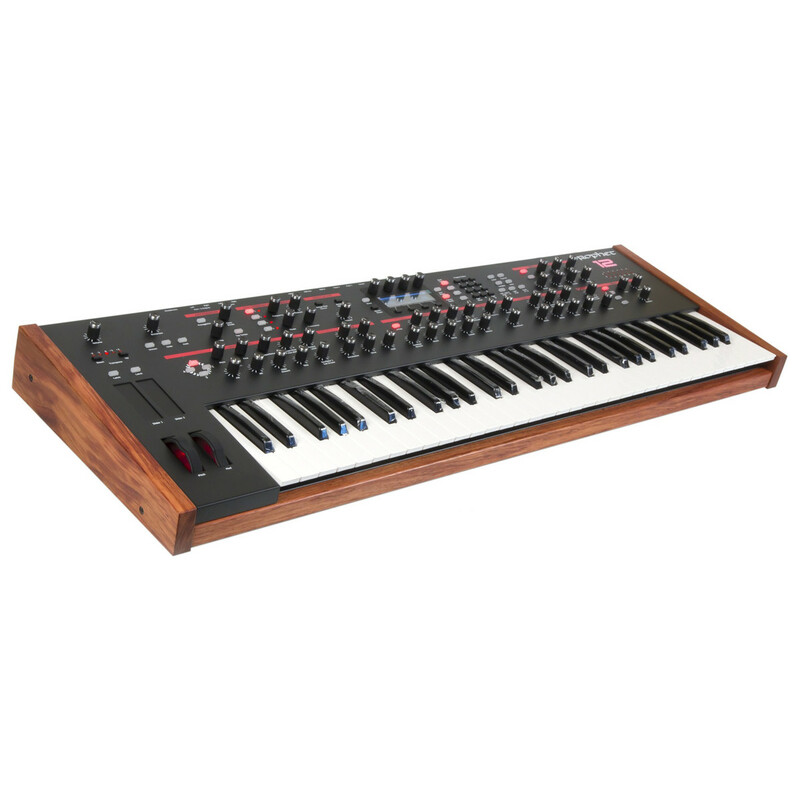 The Prophet 12 is a modern, professional synthesizer that combines an elegant build with cutting edge features. The synth's full sized keyboard gives you five octaves of semi-weighted keys boasting channel and velocity aftertouch for great playability. Add to this two backlit pitch and mod wheels and two location and pressure sensitive touch sliders and you have a wealth of controls to choose from. 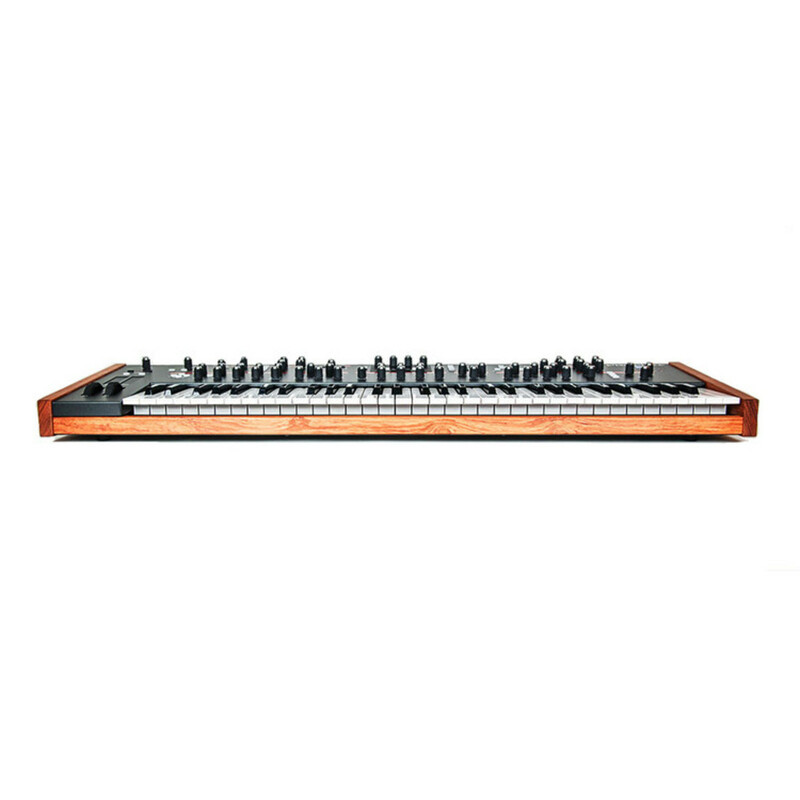 The Prophet twelve is a sleek Dave smith synth ready to handle whatever you can throw at it! Packed with a ton of sonic possibilities and power, the Prophet 12 invites you to control every aspect of your sound. The instinctive interface allows you to program and edit every parameter from the synth's front panel. Whether in the studio or on stage, you'll be able to access what you want quickly and easily without any extra fuss. 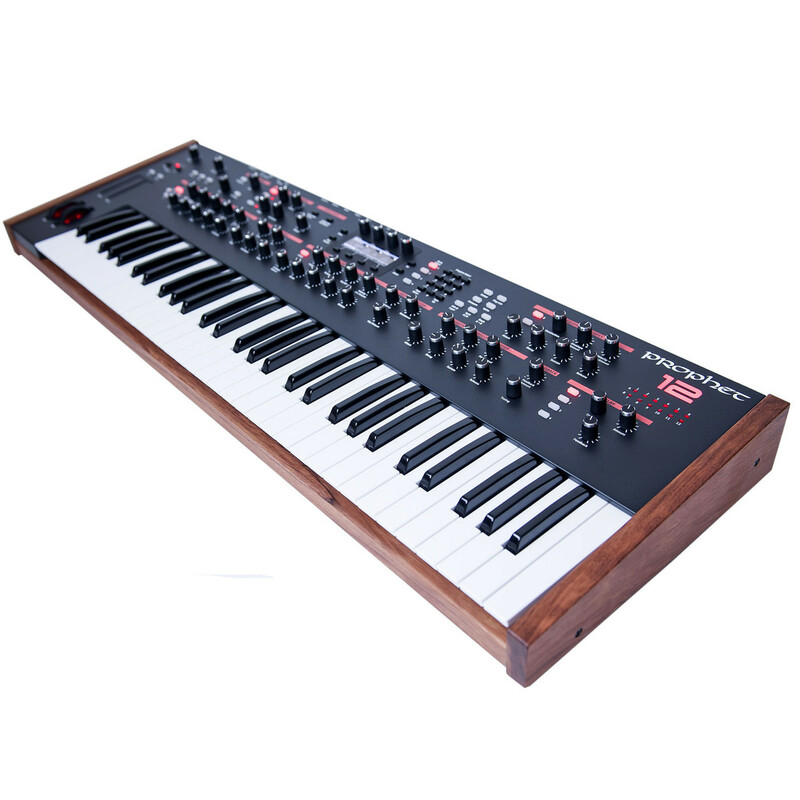 Each of the Prophet 12's voices is built using a new hybrid digital/analogue architecture which means it sounds difference to any other DSI synth. A digital front end is followed by an all analogue signal path output and each voice has five high res digital oscillators, a resonant Curtis low-pass filter, a digital character effects section, a high-pass filter, tuneable feedback circuit, a four-tap delay line with feedback per line, four loopable five stage envelope generators, four syncable LFOs with slew and phase offset, sophisticated arpeggiator and a sixteen slot modulation matrix with 26 mod sources and 97 modulation destinations! 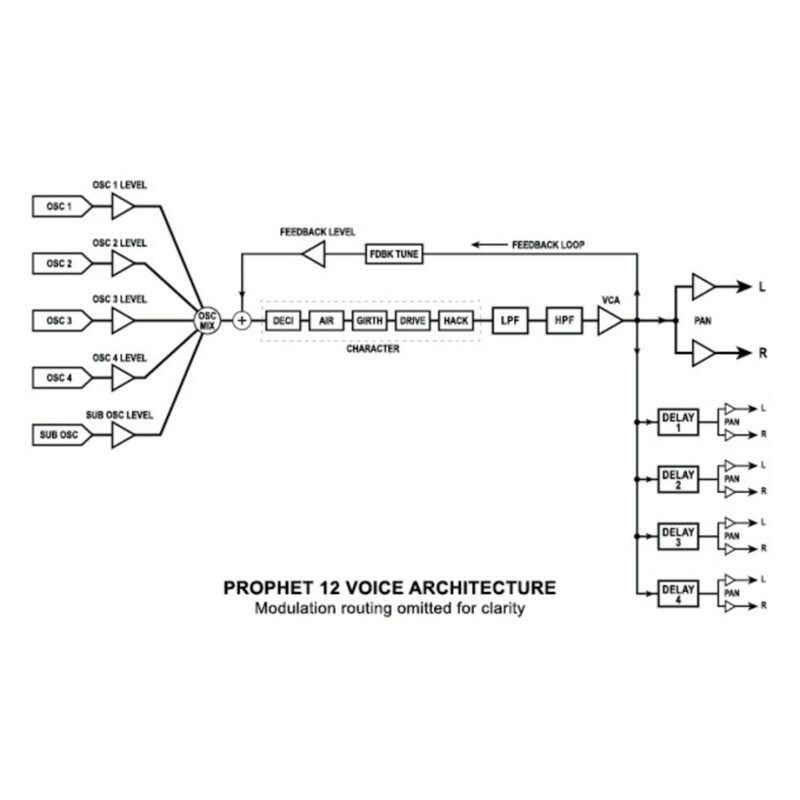 The Prophet 12's digital oscillators can be frequency and amplitude modulated by each other with impressive accuracy. You can freely assign them in whatever operator and modulator configurations you choose or each assigned to modulate LFOs, envelopes and filters.